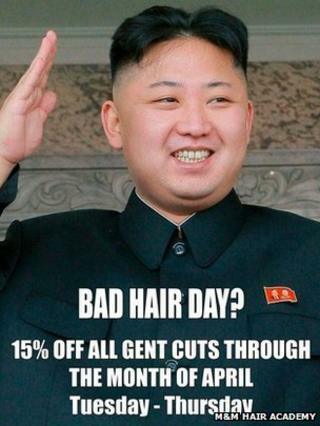 North Korean officials paid a visit to a London hair salon to question why it had used their leader Kim Jong-un's picture in a poster offering haircuts. The poster in M&M Hair Academy in South Ealing featured the words "Bad Hair Day?" below the leader's picture. Barber Karim Nabbach said embassy officials were shown the door and the salon's manager spoke to the police. The Met Police said: "We have spoken to all parties involved and no offence has been disclosed." The salon put up the poster on 9 April and the next day two men claiming to be officials from the North Korean embassy visited the salon and demanded to meet the manager, Mo Nabbach. Karim Nabbach said: "We put up posters for an offer for men's hair cuts through the month of April. Obviously in the current news there has been this story that North Korean men are only allowed one haircut. Image caption Karim Nabbach said the advert was "cheeky"
"We didn't realise but the North Korean embassy is a 10-minute walk from the salon. The next day we had North Korean officials pop into the salon asking to speak to the manager. "He said 'listen this isn't North Korea, this is England, we live in a democracy so I'm afraid you're going to have to get out of my salon'." Media captionSalon owner's son Karim Nabbach tells Radio 4's PM about the "men in black suits"
"We haven't had any trouble since then, if anything the poster has become a tourist attraction," Karim Nabbach said. Speaking to BBC Radio 4's PM programme, he added: "A lot of our loyal clients found it hilarious and people on the street came in and complimented us on it and it drew in a little bit of business. "No-one asked for the 'Un'. "It was never intended to be a political statement, it's all tongue-in-cheek. We were just using it as a cheeky ad campaign." Last month it was reported by Radio Free Asia that male university students in North Korea were now required to get the same haircut as their leader.